A Legend Returns, all new Toyota Supra makes world debut first after 21 Years. The 2020 Supra goes on sale in summer of 2019 and will be available in two grades – 3.0 and 3.0 Premium, as well as a Launch Edition which will be based on the 3.0 Premium grade. Driving enthusiasts can look forward to an exhilarating blend of power, precision and agility thanks to a rear-wheel drive design that honors Toyota sports car heritage with its low center of gravity and optimal weight balance. There is a strong connection to Toyota’s 1967 2000 GT and 1993-2002 Supra in both design and mechanical configuration. Yet, the 2020 Supra is a fully forward-looking sports car, brimming with a cutting-edge powertrain, chassis and multimedia technology. Like the pinnacle of the previous Supra series, the 2020 model will be powered by a turbocharged inline six-cylinder engine. The new Supra’s 3.0-liter twin-scroll turbo six will produce 335 hp and 365 lb-ft of torque and will be teamed with a quick-shifting 8-speed automatic transmission with paddle shifters. Toyota projects 0-60 mph acceleration in 4.1 seconds, which makes this the quickest toyota-branded production vehicle to date. By defining specific performance and handling targets early in development, Toyota GAZOO Racing in Japan, with much input from Toyota Motor North America and Toyota Motor Europe, imbued the Supra with its own driving characteristics. While posting the kind of performance numbers that excite enthusiasts, the 2020 Supra will reward drivers of all skill levels with a thrilling sports car feel, even in everyday driving. Toyota President and Master Driver Akio Toyoda tested the Supra on the Nürburgring and other racing venues to give his personal feedback as a Master Driver to ensure this new model would exceed the expectations of Supra fans across the globe. Supra devotees have waited a long time for the next-generation model. They’ll find the 2020 Supra worth the wait. 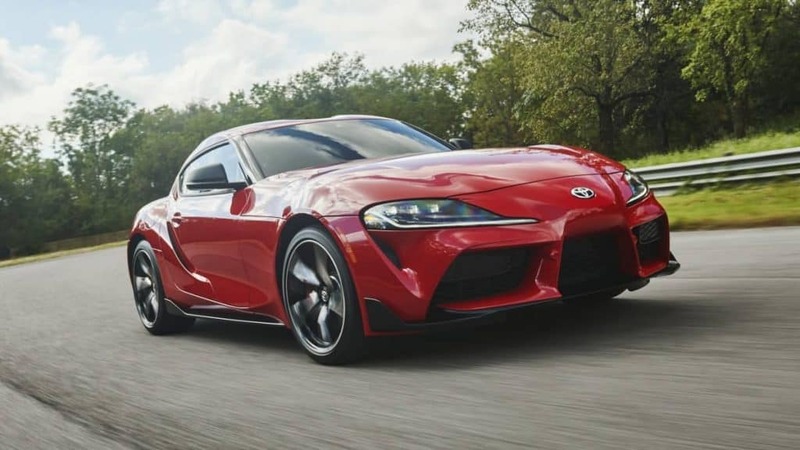 The 2020 Supra embodies its rich lineage at first glance, with a design that shows a particular kinship with the fourth-generation Supra built from 1993-2002, as well as the landmark 1967 Toyota 2000 GT. 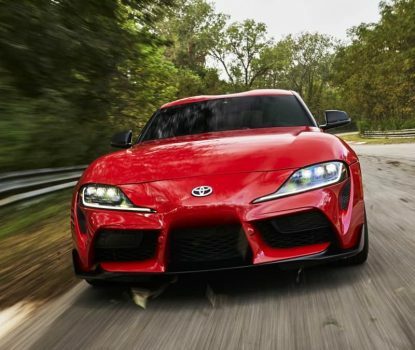 The resemblance is more than skin deep: the new-generation Supra also shares with those notable models the common traits of a short wheelbase, sophisticated chassis, and high-performance inline-six-cylinder engine. Toyota offered a glimpse of the new Supra’s design theme in 2014 with the dramatic FT-1 concept car that emerged from Toyota’s Calty design center in California. Supra’s striking exterior design was inspired by the FT-1’s expressive form. Optimization of the FT-1 design onto the efficient, high-performance packaging of Supra was achieved by condensing the forms, reducing unnecessary elements and further enhancing the dynamic and powerful character. 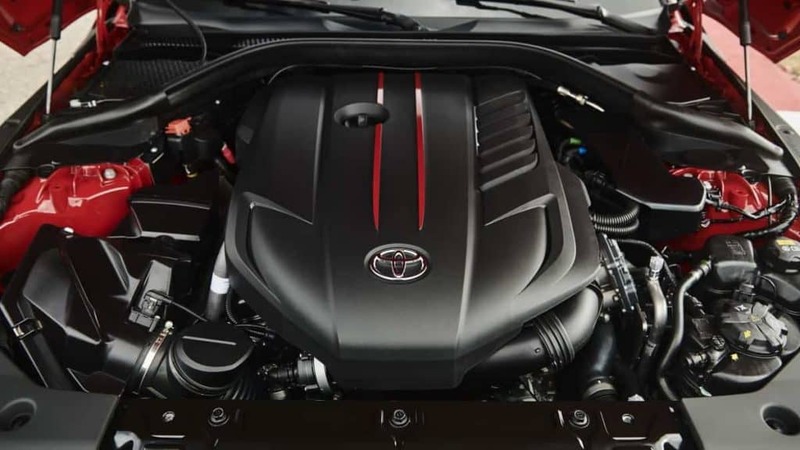 It focuses on core Supra attributes, such as its inline six-cylinder engine and rear drive layout, while enhancing other features, such as stretching the hood to highlight the engine, creating a taut, but spacious two-seat cabin that helps accentuate an ultra-wide stance. The result is a look unique to Supra internally referred to as “Condensed Extreme.” The Supra design delivers a 50:50 weight balance while optimizing front-to-rear aerodynamic balance. Toyota sports car heritage is evident throughout. The double-bubble roof design, for example, recalls the Toyota 2000 GT and it reduces drag by shaving the roof center to reduce the projected frontal area without sacrificing occupant headroom. The front fascia was inspired by the fourth-generation Supra, yet is even more expressive, with a prominent central grille section flanked by large air intakes. 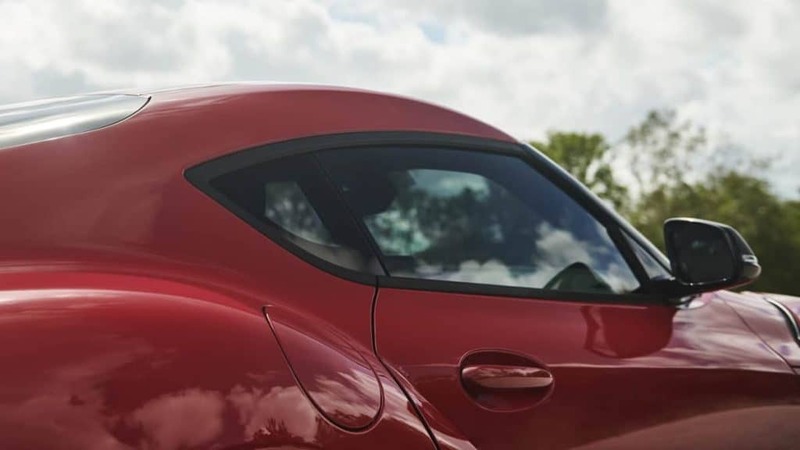 In the rear, the prominent, arching rear integrated spoiler, which helps to suppress aerodynamic lift, pays homage to the tall rear wing that was available on the fourth-gen Supra Turbo. The trapezoidal rear bumper shape conveys a dynamic sense of movement toward the tires. The six-lens LED headlights integrate both daytime running lamps and turn signal functions to create a distinctive lighting signature for the new Supra. The rear combination lamps feature a simple structure with the turn, tail, and stop functions integrated into the distinctive main ring shape. The backup lamps are LEDs located in the center of the lower bumper. Expressive colors accentuate the emotional connection drivers feel with a high-performance sports car, which is why the 2020 Supra’s paint palette will include bold Renaissance Red 2.0, Nitro Yellow and Downshift Blue. The available Phantom Matte Gray adds a sense of drama to the Supra’s tautly curved surfaces by combining a matte finish and a hint of blue to create a metal-like texture. Other available colors include Absolute Zero White, Tungsten Silver, Turbulence Gray and Nocturnal Black. Fun fact: In the new version of the famous Supra logotype, the “S” was inspired by a racetrack s-bend. The 2020 Supra cockpit deftly blends traditional GT elements with ultra-modern functionality. The low, narrow-section dash gives the driver expansive forward visibility, ideal for precisely placing the car in corners. A high-definition color display forms the instrument panel, projecting a large-diameter, three-dimensional meter dial that seems to float over it. The single-meter design consolidates information necessary for performance driving, such as the tachometer and shift-timing indicator, enabling the driver to easily focus on critical control information through the small-diameter steering wheel. The display’s easy-to-read layout puts multimedia information, including audio and available navigation, on the right side. An available full-color Head-Up Display projects vital driving and navigation information ahead of the driver. Toyota designers took a fresh approach to design the center console, giving it an asymmetrical shape that tightly envelops the driver, with a padded pillar that serves as a right leg bolster. The passenger’s side of the console, meanwhile, is open for a roomy feel, yet also features kneepads for bolstering in corners. The center console tightly groups controls for sports driving. The climate control panel protrudes from the center dash, easing operation without averting eyes from the road. Toyota designed the 2020 Supra to be both an everyday sports car and an occasional track car. To that end, its sport seats, featuring integrated head restraints, were inspired by racing. The seats use a narrow main section combined with the shoulder bolsters to firmly hold the driver and passenger. The 3.0 Premium grade will feature heated, leather-trimmed seats, while the 3.0 will come with Alcantara power seats with memory. Supra’s smartly trimmed luggage area, accessed via a lightweight composite hatch, offers capacity for two people to pack for a weekend getaway. The compartment is shaped to accommodate long items, such as a track day toolkit. The 2020 Supra will feature a 3.0-liter turbocharged inline six that will produce 335 hp and 365 lb-ft of torque. The torque comes on strong from very low engine speeds, thanks to a combination of a twin-scroll turbocharger, direct fuel injection and continuously variable timing on both the intake and exhaust camshafts. Engine response is further enhanced thanks to the inline six’s variable intake valve lift system that adjusts intake valve timing and duration. The 8-speed automatic transmission delivers quick up- and downshifts and features paddle shifters for manual control when desired. Short ratios for the lower gears and a Launch Control function enable powerful acceleration with maximum traction. Toyota estimates 0-60 mph acceleration in 4.1 seconds. Top track speed will be electronically limited to 155 mph. The 2020 Supra will offer two driving modes, Normal and Sport. Sport Mode provides track-driving capability by reducing intervention of the traction and stability control functions as well as sharpening throttle response, increasing steering weight, improving transmission shift crispness, more aggressive active differential tuning and amplifying exhaust sound. For performance driving enthusiasts, the Supra will have an active differential that uses an electric motor and multi-plate clutches to control lateral torque. The active differential precisely controls torque distribution between the rear wheels, with stepless variable locking from 0-100 percent. The differential can control torque distribution between the rear wheels when cornering under both acceleration and braking, enabling greater momentum through a corner. The active differential is also effective at ensuring neutral handling by reducing both understeer and oversteer. Toyota GAZOO Racing had a specific vision when developing Supra. High structural rigidity, a low center of gravity and 50:50 weight distribution were paramount to Toyota’s goal of achieving neutral cornering balance. For example, Toyota identified nine areas of the vehicle’s rear structure to be reinforced to increase rigidity. Toyota also specified spring and shock absorber tuning for the new double-joint spring strut front suspension and multi-link rear suspension. Likewise, Toyota set specific parameters for the Supra’s stability control system performance. The front suspension subframe and control arm mounting points are extremely rigid to yield precise cornering characteristics. Aluminum control arms reduce unsprung weight, resulting in superior agility and efficiency. High-performance wheel hubs feature increased stiffness and optimized kinematics. For precise handling, Supra features a variable assist and variable ratio sport-tuned electric power steering. The multi-link rear suspension with a five-arm construction consists of lightweight aluminum to reduce weight while steel is employed in key areas for added strength and durability. The rigid rear subframe and the bracing that connects it to the body structure helps ensure extremely precise wheel control. Supra will come standard with 19-inch forged alloy wheels. The rear wheels and tires are wider than on the front (rear tires: 275/35R19; front tires: 255/35R19) to enhance grip, and performance Michelin Pilot Super Sport tires are fitted. Brakes are large at all four corners, highlighted by 13.7-in. front rotors held by 4-piston Brembo calipers. Standard on all Supras is Adaptive Variable Suspension. Adaptive Variable Suspension system instantly adjusts damping force in response to driver input and road conditions. Two settings for the suspension are available – Normal and Sport. 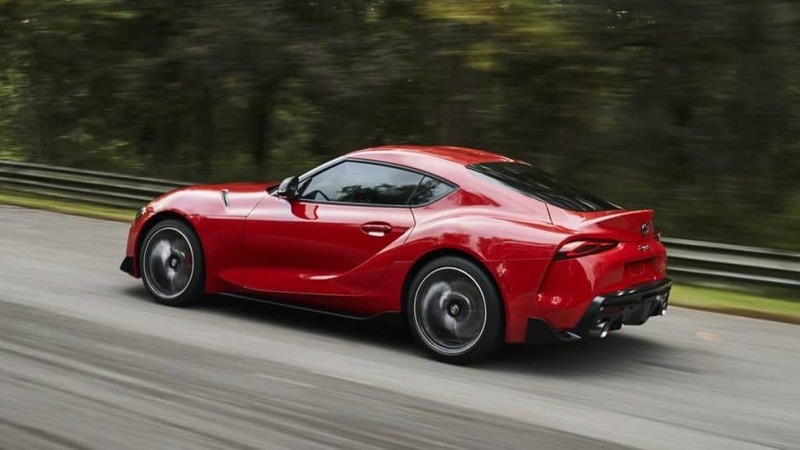 Road and track development took place in France, Austria, Italy (including many winding roads through the Alps), Germany (including the Nürburgring track), Sweden (ice and snow road testing), the U.K., Japan, Australia, and the U.S. A global citizen, the new Supra will be assembled at Magna Steyr in Graz, Austria. Like its 1990s predecessor, the 2020 Supra will be equipped as a premium GT, with a deft balance of function and premium comfort and convenience features. Keyless Smart Entry, dual automatic climate control, auto-dimming rearview mirrors, rear camera, rain sensor windshield wipers, garage door opener, power folding mirrors, and a leather-wrapped steering wheel will be standard. Standard active safety features include forward collision warning, automatic emergency braking with pedestrian detection, lane departure warning with steering assist, automatic high beam and road sign assist. Additional active safety and convenience features available are adaptive full speed cruise control, blind spot monitor, rear cross traffic alert and rear end collision warning. The new-generation Supra will of course deliver a state-of-the-art multimedia and connectivity experience. The 3.0 grade features a 6.5-inch display that can be operated by the rotary controller on the console, as well as Bluetooth and iPod capability. The 3.0 Premium grade will get an 8.8-inch touchscreen display with navigation, rotary touch controller, Supra Connect telematics services, wireless Apple CarPlay, a premium 12-speaker JBL audio system, and wireless phone charging. The JBL audio system and navigation will be an available option on the 3.0 grade. 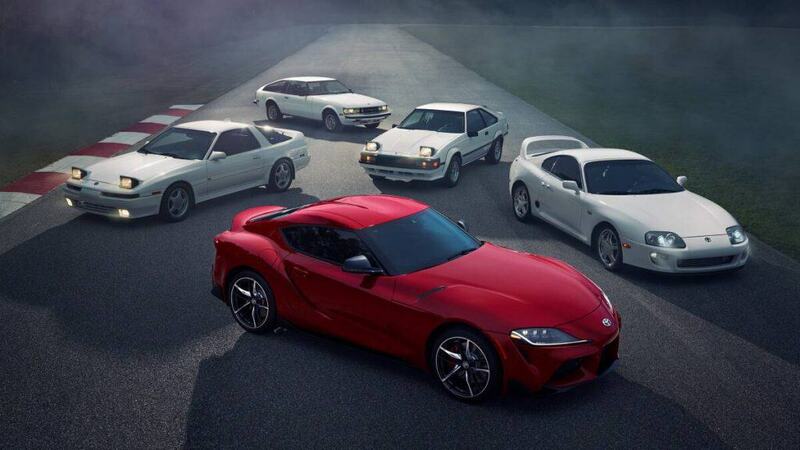 The 2020 Toyota Supra traces a 50+ year lineage to Toyota’s first sports car, the 1965 Sports 800. This sleek but tiny (140-in. long) coupe offered a little over 40 horsepower from an air-cooled, two-cylinder boxer engine. The Sports 800 weighed just 1,300 pounds and could reach 100 mph in racing trim. It was successful in long distance races where reliability and fuel economy worked to its advantage. Here’s one for car trivia buffs: The 800 Sports was the first production sports car to have a lift-out aluminum roof panel. In 1967, Toyota stunned the sports car establishment with the limited-production, hand-built 2000 GT. This six-cylinder, two-seat coupe smashed three world records and set 13 new international records for speed and endurance. Just 351 of the 2000 GTs were made, about 60 of those left-hand-drive for export to the U.S. Nevertheless, many Americans saw the 2000 GT when a specially built roadster version was the automotive star in that year’s James Bond film, You Only Live Twice. Today, 2000 GTs can approach $1 million in collector-car auctions. In 1978, Toyota introduced the first Supra (A40) as a premium, six-cylinder version of the popular Celica sports coupe. Four years later, Toyota began to separate the Supra from the Celica, with the second generation (A60) featuring a completely different front-end design and a striking Performance model with wider wheels and fender flares. With the debut of the third-generation model for 1986 (A70), the Supra became its own distinct car. The following year, the Mk. III, as Supra aficionados call it, debuted a Turbo upgrade model with 230 horsepower. Then came the icon: the fourth-generation Supra (A80, or “Mk. IV” to Supra buffs) arrived in 1993 and upended the global sports car / GT hierarchy. The Supra Turbo used twin sequential turbochargers to extract 320 horsepower from its 3.0-liter inline six. This utterly unique sports GT could accelerate from zero-to-60 mph in under 5 seconds, trouncing direct competitors, as well as some European models costing 2-3 times as much. The Mk. IV Supra left Toyota’s U.S. lineup after 1998 but was produced until 2002. 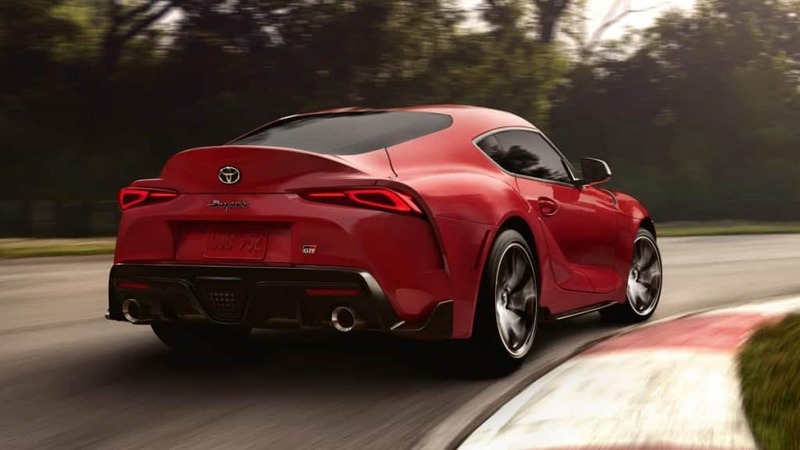 It went on to become famous for new generations in video games and in the Fast and Furious film series, stoking an intensely loyal following that helped spur Toyota to develop the all-new, fifth-generation Supra for 2020.